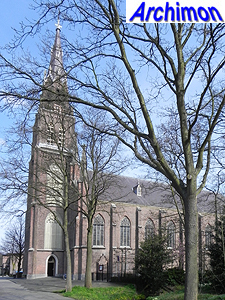 Despite the Reformation, a large part of the population of Voorschoten remained catholic, although their faith was forbidden and they lost their church to the protestants. 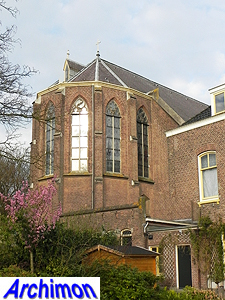 At the end of the 17th century a barn church could be founded in the current north of the village, but at that time actually outside the village; although the officially protestant authorities became more willing to tolerate catholic religious activity (that is, as long as they paid) they made sure catholic churches did not look like churches and were, if possible, located outside population centers. The barn church served until well into the 19th century and was ultimately demolished in 1871, a few years after it was replaced. Before that, it had been rebuilt various time. 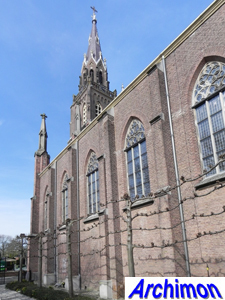 In 1863 the parish got a new priest who soon decided to build a new and bigger church next to the old one. Architect Th. 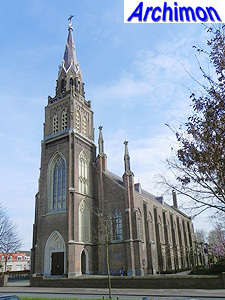 Asseler was selected to design the new church, but why he was chosen is unknown; perhaps he was seen as the successor of his highly influential uncle and former employer Th. 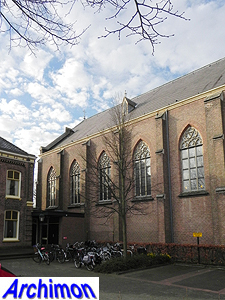 Molkenboer who died in December of that year and who had previously, at least that is what some sources say, rebuilt the barn church. Asseler himself had earned a reputation as his uncle's competent overseer, but not as an architect. 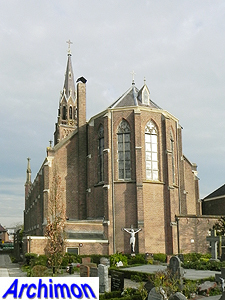 The St. Laurentius was probably the first church Asseler designed and built, although it is possibly preceded by the enlargement of the church of Haarlemmerliede. 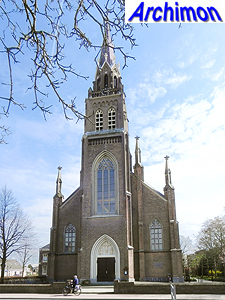 In December 1865 builders were invited to tender, on March the 20th 1866 the corner stone was laid and on August the 17th 1868 the church was consecrated. 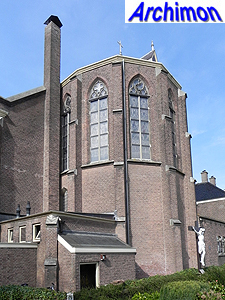 Asseler had designed a pseudo-basilica in early neo-Gothic style, not unlike some of his uncle's churches. 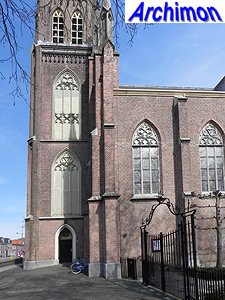 Contemporary newspapers lauded the "pure 14th-century Gothic style" and especially the tower. Actually, there isn't much pure Gothic about the church, style periods aside. It's a good example of early neo-Gothic and as such shows little evidence of knowledge about true Gothic. 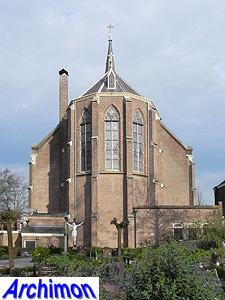 It has a lay-out that reminds of the neo-Classical churches that were build in big numbers not much earlier that century; a straight pseudo-basilican ground-plan without a transept and with a simple polygonal choir underneath a single roof. The interior is covered with vaults of plaster, and the pinnacles at the front are purely ornamental. 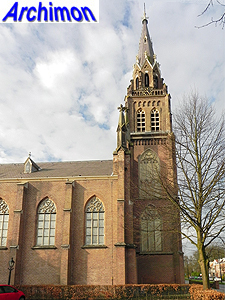 The tower consists of four square segments and one octagonal segment plus spire, but the front suggests otherwise; the floor between two stories can be seen in the big window. 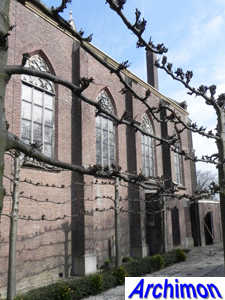 The decorative niches with traceries at the sides of the tower remind of Molkenboer's church in Overveen. 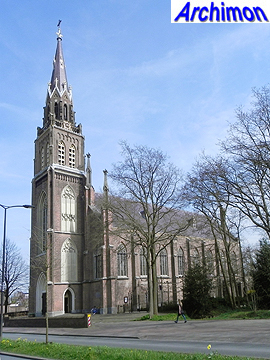 Asseler worked as Molkenboer's overseer at this church, which helped him launch his own reputation. 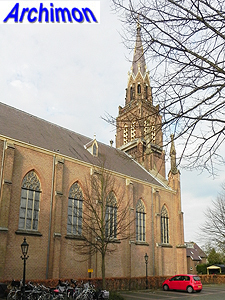 The St. Laurentius remained Voorschoten's single parish church until 1967, when a second parish was founded in the south of that village. 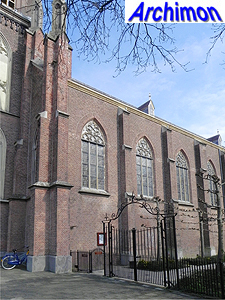 The church of that parish was closed in 2016 and will probably be demolished. 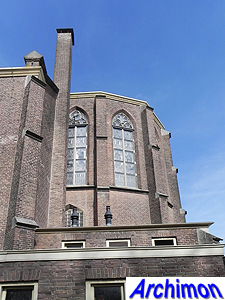 The St. Laurentius is a protected monument.